Beautiful ivory gown that makes an incredible statement. This dress buttons down the back with 33 satin covered buttons. I can find no label, but I was told it is a dress from the 40's. It has a classic style and glass "pearls" in the middle of each circular lace pattern, which makes me believe it is at least earlier than the 60's. This dress has a V neck that sits low on the neckline, almost off the shoulder. There are glass beads that decorate the lace that is around the neckline and then down the front of the dress. The satin has a rich sheen to it. After hand washing, then steaming this dress, I did find some yellowed spots. There is one on the front of the dress, near the bottom, and perhaps two to three more. The yellowing spots are hard to find and I would not have seen them had I not been on my knees for three hours hand steaming this dress. 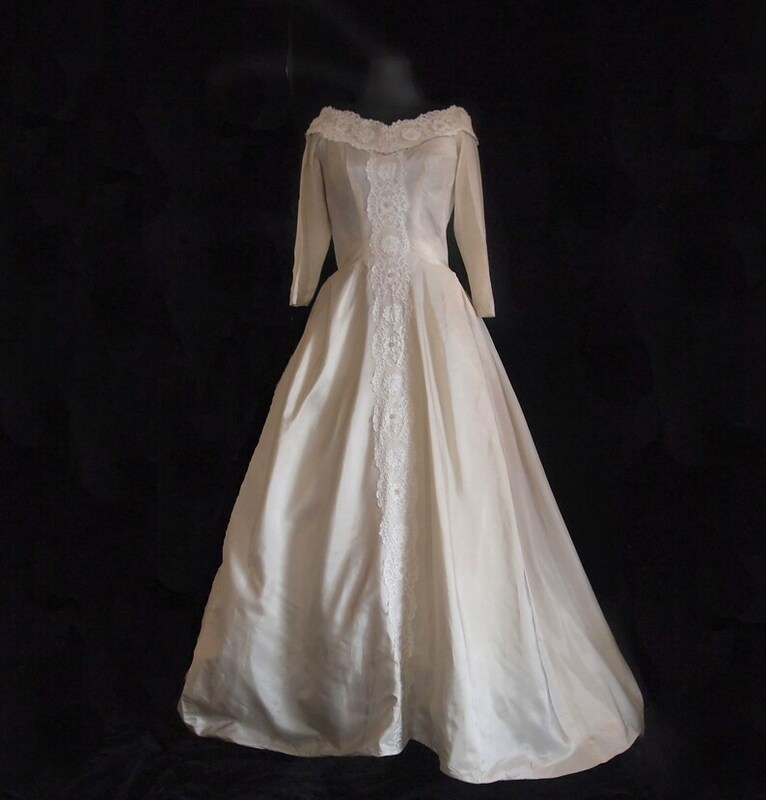 Were this my wedding dress, I would take it to the cleaners to see if they could be removed, but the dress looks great as it is and will arrive to you clean. The 33 buttons have fallen off and when I am recovered from steaming the 12 yards of fabric in this dress, I will put those back on. I love, love, love the simplicity, elegance and flattering style of this dress.